All new students are created as "Active" in our system and visible from the My School --> Students page of the website. These active students appear in the app and across the website. 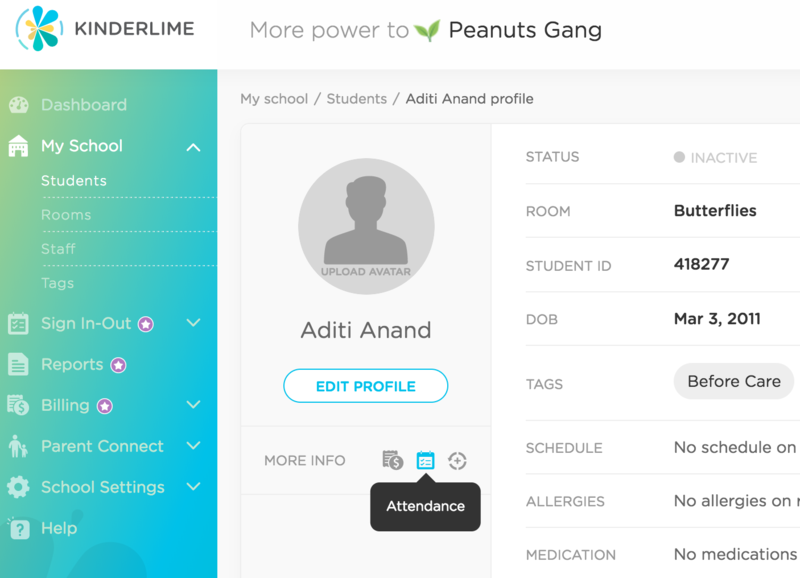 The students' parents have the ability to sign up for a Kinderlime account, log in to view their child's dashboard, Sign In-Out, and send/receive messages. However, there will come a time when an active student will leave your program, either temporarily or forever (more or less). In these cases, you will want to place them On Hold, make them Inactive, or Graduate them. Unless stated otherwise, our system looks at your Active student list when determining how many students to charge for your account's subscription each month or year. That's why it's very important that students who no longer attend your program, or demo students who were in your account for testing purposes, are removed from the Active enrollment list as soon as possible. To begin, you will select the check box next to the student(s) whose status needs to change. This will automatically change the filters along the top to "Select Batch Action" mode. Select "Change Enrollment" from the Select Batch dropdown and choose the desired enrollment status for the students. If the student will be leaving your program temporarily, with the intention of coming back after one or more billing cycles, you will need to put that student On Hold. You cannot send messages to students who are on hold. The parent will be able to log into the app if they had signed up while the student was previously Active. The remaining enrollment status options both achieve the same goal -- removing the student from your active roster. However, both are listed as an option for programs who wish to distinguish between students who have academically graduated from the program (never to return) and students who have moved away or otherwise left the program prior to graduation (also never to return). The pin codes will remain attached to the parents and authorized pickups of the child, but will no longer be usable during Sign In-Out. Parents will still have the ability to log in to their account and view their child's information. You can always return to the My School --> Students page to view students of any enrollment status. Click on the enrollment filter, which is by default set to "Active" on the Students screen. Select the group of students you would like to see. Whether the students are On Hold, Inactive, or Graduated, the system will pull up the list of students. To change a student back to Active (or to another status), follow the same steps as listed above. You can also click on the student's name to view their profile, billing, and attendance data.